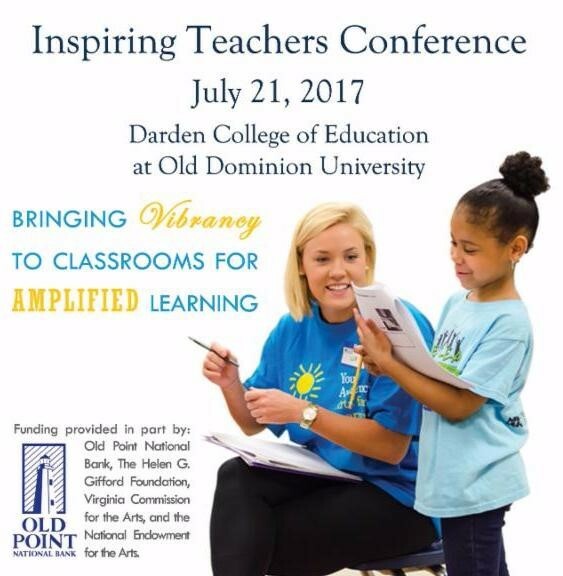 Young Audiences Arts for Learning Virginia (YAV) and Old Dominion University College of Education present 2017's Inspiring Teachers Conference! The Inspiring Teachers Conference is an unforgettable learning opportunity for teachers to energize their classroom methods, learn arts-integration techniques, and try different approaches to core curriculum through hands-on experiences with different art forms. Through dance, visual art, theater, instrumental and vocal music, educators will explore math, science, history, literacy and more. Facilitated panel discussions provide opportunities to speak to YAV's professional teaching artists on approaches to blending the arts with core curricula. Breakout sessions include in-depth lecture-demonstrations and movement opportunities to learn and work through an arts-integrated curriculum designed especially for specific grades and subjects. This Arts Integration and STEAM conference will have you moving, learning and connecting with arts integration professionals and other like-minded teachers throughout Hampton Roads interested in integrating the arts into their classrooms. You will leave with practical tips, resources and fresh ideas on how to approach teaching and learning. Professional development conference for educators teaching pre-k through high school students in core curriculum and art classrooms. Offering professional development in arts-integration techniques that improve students' literacy skills, motivation to read, and ability to learn. $70 registration fee includes parking, breakfast, snacks, lunch and professional development points!